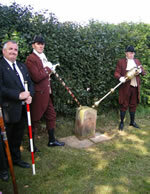 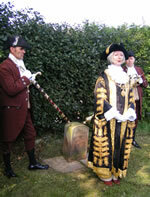 These photos were taken on 28 April 2007 during the Beating the Bounds ceremony at the boundary stone where the '39 Steps' footpath joins Waste Lane. 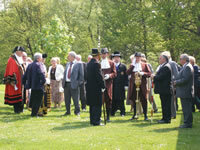 The ceremonial party, including the Lord Mayor of Chester and two representatives from Kelsall Parish Council (Noel Dutton and John Leather), travelled by coach from Chester Town Hall to four boundary stones before heading for lunch at The Oak. 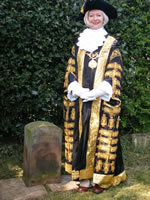 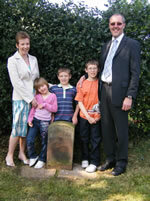 The boundary stones visited were those at Bumpers Lane, Blacon (Western Ave), Stanney Woods and Kelsall. 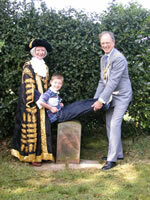 The school boy who was ceremoniously bumped at the Kelsall boundary stone was Stephen Macaulay of Kelsall School and Orchard Way. 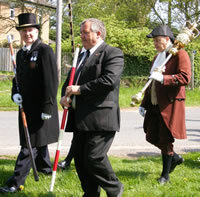 More information on the Beating the Bounds ceremony can be found here. 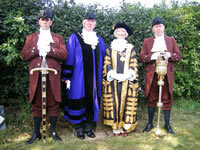 Thanks are due to Lesley Falshaw of the Lord Mayor's Office for this information and for providing the captions beneath the photos.